These maps explore the American Community Survey 5-year data (Table S1810) on disability estimates by county. For independent living difficulty the ACS asks because of a physical, mental, or emotional problem, does the respondent have difficulty doing errands alone such as visiting a doctor’s office or shopping. If they answer “yes” they are classified as having an independent living difficulty. This data is for ages 18 and up. This map of the United States shows rates of independent living difficulty by county. Rates are broken into four categories ranging from 0.8 to 25.8%. 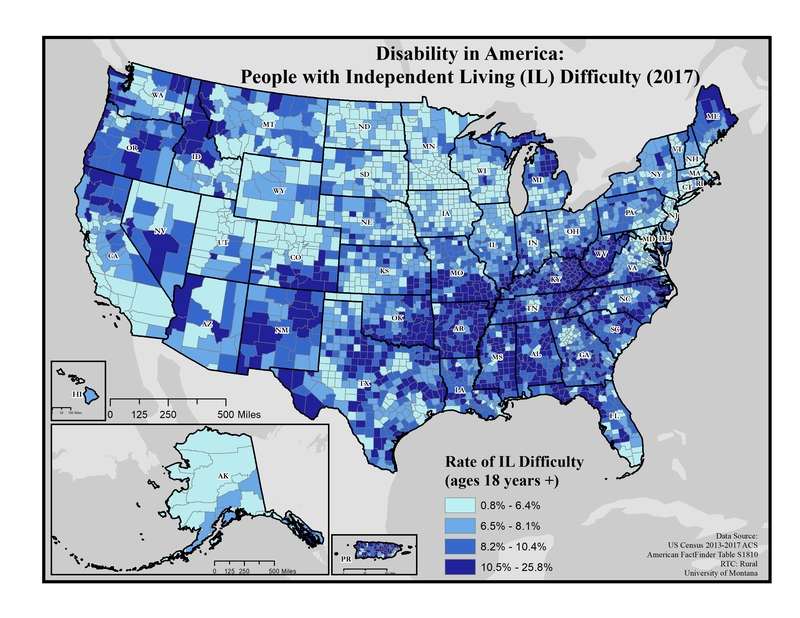 Rates of independent living difficulty appear to be highest (10.5 to 25.8%) in the Appalachia region (particularly along the Kentucky/West Virginia border) and throughout the South, northern Michigan, northern Maine, New Mexico, northern California, and parts of Oregon. Rates appear to be lowest (0.8 to 6.4%) in Alaska, the Rocky Mountain and Great Plains regions, northern Nevada, and Utah. 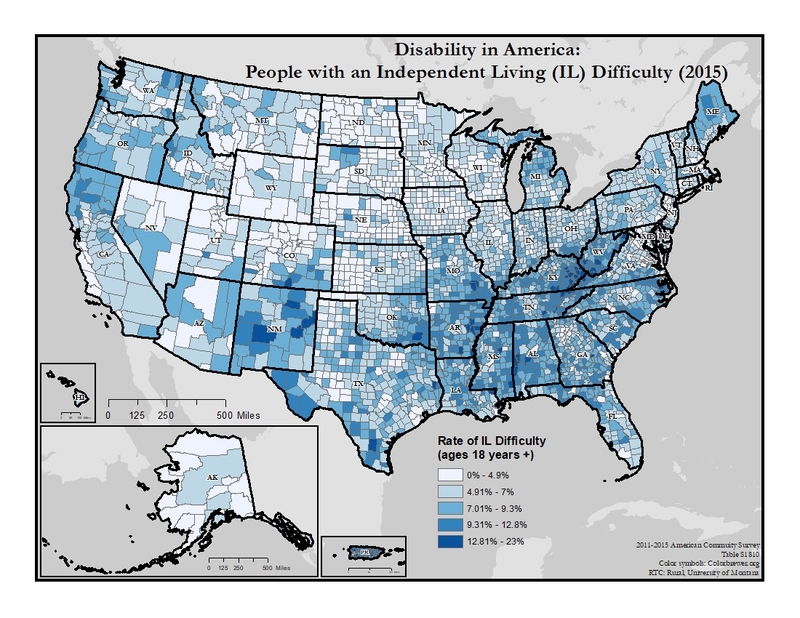 Map of people reporting independent living difficulty in the United States. Click on the image to view a full size, shareable version of the map. This map of the United States shows rates of independent living difficulty by county. Rates are broken into five categories ranging from 0.0% to 23%. Rates of independent living difficulty appear to be higher (9.31-23%) in the Appalachia region (particularly along the Kentucky-West Virginia border) and throughout the South, northern Michigan, northern Maine, New Mexico, northern California, parts of Oregon. Rates appear to be lowest (0.0-9.3%) in Alaska, the Rocky Mountain and Great Plains regions, northern Nevada, Wyoming and Utah. 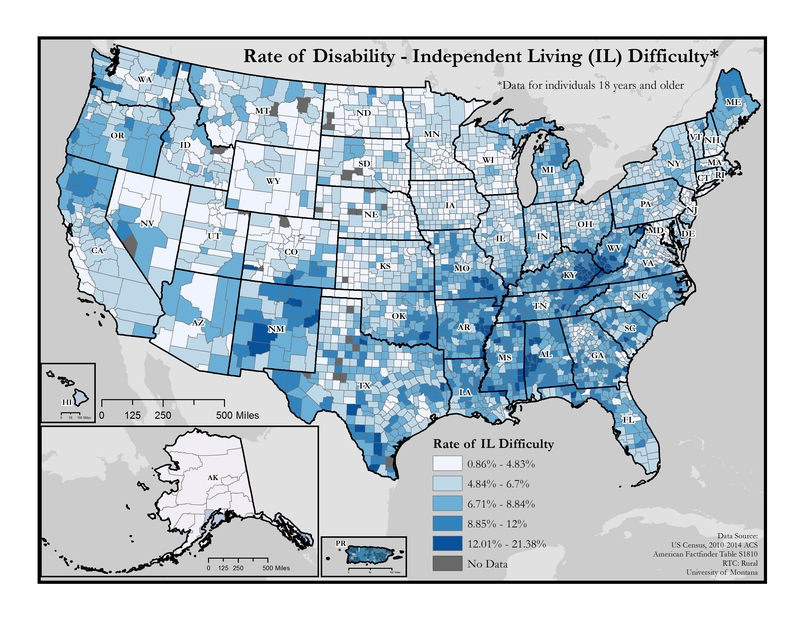 This map of the United States shows rates of independent living difficulty by county. Rates are broken into five categories ranging from 0.86% to 21.38%. Rates appear to be consistently higher (8.85-21.38%) in the Appalachia region and throughout the South, especially along the Kentucky-West Virginia border, as well as Puerto Rico and areas of New Mexico, western Texas, northern Michigan, and Maine. Rates appear to be lowest (0.86%-8.84%) in Alaska and the Rocky Mountain and Great Plains regions.